Pay Bill Maintain Your Account. 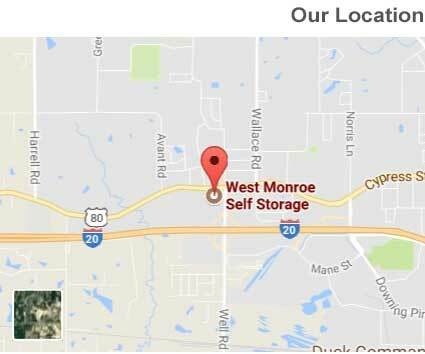 Located right off of I-20, West Monroe Self Storage provides easily accessible self storage for all local residents and businesses. Looking for Monroe storage? Need self storage in Claiborne? We are happy to serve all areas in Ouachita Parish with clean and quality storage units at a cheap rate. No matter what you need to store, we’ve got a storage space here with your name on it! Take US-165 S headed south and continue to follow past Lakeshore. Use the right lane to merge onto I-20 W via the ramp to Shreveport. Keep left to stay onto I-20 W. Take exit 112 for Well Road. Slight right onto Well Rd. Turn right onto Cypress St, and our West Monroe storage will be on the right. Take I-165 N headed north toward Taylor Ln. Use the right lane to take the ramp to Shreveport. Merge onto I-20 W. Take exit 112 for Well Road. Slight right onto Well Road. Turn right onto Cypress St, and our West Monroe storage units will be on the right. Take I-20 W to Well Road in West Monroe. Take exit 112 from I-20 W. Slight right onto Well Rd. Turn right onto Cypress St, and our storage in Monroe will be on the right. Take I-20 E to Well Rd in West Monroe. Get off at exit 112 from I-20 E. Drive to Cypress St, and our storage units West Monroe will be on the right.